Cancel Church on Sunday and Serve the neighborhood. One of the blogs I read (Fierce Grace) decided to do something entirely different on a Sunday morning. Read about it at The Church Has Left the Building. I have often mentioned that some churches can do this. However smaller churches can easily take this idea and run with it. Leading up to this Sunday off was a sermon series. The whole series is mapped out at “Beginning this Sunday” and the follow up posts in that series continues to map out the theology and the practice that led up to that Sunday. The Samaritan took a risk, got personally involved, spent some time and some money to help the man in need – He put himself out to help someone else get through. That’s what we are called to do if we’re going to love our neighbor like we love ourselves. Jesus’ mission is our mandate (Luke 4:14-21) – and it’s people-centered, outwardly focused, and compassion driven. If we can see people as He saw them, sees them, we will overflow with ideas and discover dozens of practical ways to show them the love of Christ. 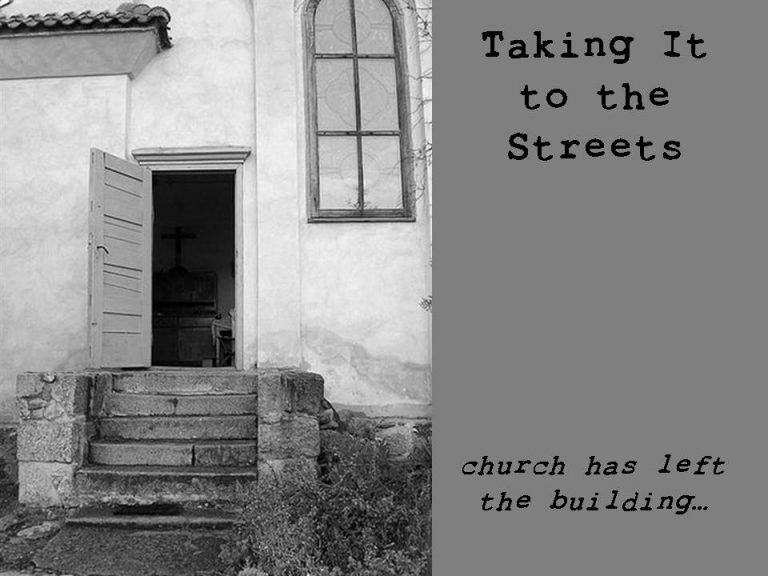 The third installment of our “Taking It to the Streets” message series focused on “Little Acts with Big Impact.” We looked at Jesus’ description of the Kingdom in Luke 13:18-21. There, Jesus said the Kingdom was like a small mustard seed that grows in to a bushy tree large enough for birds to build nests in. Then He said the Kingdom was like a lump of yeast that was worked into 50 pounds of dough to make bread for as many as 100 people! It wasn’t a surprise to the congregation but rather a vision that had been cast and people rallied to it. Thanks for chiming in. My Facebook account had a great discussion on this today. How did your campus lead up to this event. What did you do with visitors? Assuming that you normally have visitors on Sunday?